Special Relativity (SR) is one of the main cornerstones of modern physics. If SR is wrong, then everything based on it will crumble too, like a house of cards. (For example, quantum field theories and the standard model of particle physics are based on SR.) If you can falsify SR, you get 10 Nobel Prizes, not just 1, and you get a gold star from your grade 3 teacher. SR has something very unusual. SR has a Rule Zero: a rule for making all the other rules. This Rule Zero is interesting because it's a set of handcuffs: it's very tightly constraining. Being tightly constrained is a good thing for a scientific theory, because it's easier to falsify. SR is a cornerstone of modern physics mostly because of Rule Zero. SR is mathematically simple. If you know what a square root is, then you can understand the core of SR. For bonus points, if you're not afraid of a cosine, then you can understand what SR says about optics (photons and light rays). SR is a reboot of physics. It goes back to the beginning, and fixes an important mistake. When physics began in the 1600s, they had certain ideas about space and time. We now know that some of those ideas were mistaken. (Those mistakes were completely natural, since they had no data for objects moving at really high speeds.) Albert Einstein was the first person to figure this out. He pointed out the mistake, which has to do with time. In short, the mistake was assuming that time is absolute. Instead of absolute time, you have an absolute speed limit, and an absolute 'space-time interval' (see below). When you learn SR, you get to understand how time dilation works. The discovery of time dilation is one of the most important discoveries in all of science. Some have compared its discovery with the discovery that the Earth is spherical, for instance. When you know SR well, you can spot a common mistake - the mistake of forgetting about time dilation. (This mistake can even be made by trained physicists who should know better. In some cases, they know the theory, but they haven't really internalized it.) 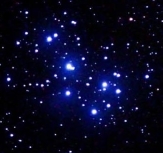 Take this statement as an example: 'The Pleiades are 400 light-years away. So, it will take at least 400 years travelling at near light speed to get there.' This statement is appropriate only in the world of Isaac Newton. In the world of SR, this statement, in unqualified form, is wrong. Why? Because in the world of SR, the time between two events in general depends on who's doing the talking. For a traveller going to the Pleiades at near light speed, the time that they care about is the time on their own wristwatch. And measured by their own wristwatch, that time is going to be less than 400 years. In principle, there's no minimum travel-time, as measured by the traveller. The nearer they approach light speed, the smaller the travel-time becomes. That's time dilation. 1. Draw a straight line from A to B. This isn't very good, because there's no information about the speed of the ball. So this picture is incomplete. 2. Draw a straight line from A to B, but also add tick marks to the the line, indicating its position, once per second. This is better, because it has information about both the position and the speed. You could say that the first try has only information about where, and the second try has information about both where and when. 3. Draw a curve in space-time. To do that, just represent the time as another coordinate in the diagram, at a right angle to the x-axis. In this case, the 1-dimensional line is replaced by a 2-dimensional plane. The tick marks that were used to indicate the time are replaced by a time coordinate. The time axis is placed vertically here, simply to follow a common convention. This is a 2-dimensional space-time. The points in this plane are events, consisting of a where (x) and a when (t). The path of the ball is a continuous sequence of connected events in space-time, which form its history, or world-line. When the ball is motionless, the history is vertical. When the ball is moving, the history bends away from the vertical. The faster the ball is moving, the more its history bends away from the vertical. The conversion factor is a fixed quantity having the unit of speed (meters per second). The speed you pick is up to you. But, as explained below, most of the time the speed is chosen to be Nature's speed limit c (see below). The basic idea of space-time is to convert times to lengths, and simply pretend that this time/length is an extra dimension, in addition to the space dimensions. It's important to understand that space-time, with its 'extra' dimension of time, is a geometrical idea, a mental abstraction. It's not something you can physically point to. The idea of representing the history of an object as a curve in space-time is not just a mathematical curiosity. Space-time actually has a lot of interesting and important geometrical structure. Nature has many important rules that can be expressed elegantly only using the idea of space-time. Indeed, it's not an exaggeration to say that the geometry of space-time is at the very core of physics. Canvas not supported. Please upgrade your browser. Sharp corners in the history correspond to abrupt changes in the motion. Gradual changes in speed are shown with curving lines. These simple animations also show how simple motions appear as histories in space-time. So let's examine these ideas in sequence. traditionally, the 3 numbers are labeled x, y, and z.
each of these 3 numbers corresponds to a distance measured along one of the axes (x, y, or z). there is an origin point, where the axes all meet, and where x, y, and z are all 0.
these axes are at right angles to each other. the sign of the numbers indicates direction, for example the +x direction, or the -x direction. So far, this scheme only measures positions. Next we'll look at measuring time with a grid. To measure time, you might think that only a single master clock would be needed for a grid. But that's hard, because you need to figure out how to measure the time of distant events. It's simpler to use multiple, synchronized clocks, that are spread out over the entire grid. (You can picture these clocks as being placed at the intersection points of the meter sticks.) When you measure the position of an object, you can measure the time as well, just by using the clock at the same location. When you simultaneously measure both the position and the time, then you measure the coordinates of an event, a where and a when. This is simpler than using a single master clock, since everything remains completely local. Now we have a system for measuring the positions of things in space, combined with many stationary, synchronized clocks (or sensors) spread out over that system to measure the time as well. Calling them sensors instead of clocks is useful, since they have to detect and record local events. Now picture making measurements with such a grid. Imagine being in interstellar space, building a grid, and then throwing objects through the grid. As the object passes by each sensor, the sensor detects the object, and records the event: at time t, the object was at some sensor location (x,y,z). The sum total of all these events (t,x,y,z) is a measurement of the history of the object. You could imagine a master computer that gathers together all these events, and reconstructs the history of the object. There are ways of making measurements that don't use grids. For example, in astronomy, there is only a single sensor (the telescope), not many, so there's no grid at all. The reason grids are emphasized here is that it's the simplest way to describe the basic rules of how measurements of space and time work. The key point is this: grids are simplest because each sensor is responsible for recording only the local events that happen in its own little neighbourhood. Any other way of looking at measurements is more complicated. Let's use the term camera to represent a single sensor. With a camera, you're usually concerned with incoming light signals from far away objects. This corresponds with actual observations made by astronomers (and by your own eyes too). It's important to understand that a camera is not a grid. A grid is always a collection of a large number of sensors, not just one. With a grid, you can make calculations using numbers from multiple sensors (as seen below). With a camera, you can't do that, since there's only one sensor. These perspectives are different, and must be kept in mind. The question of what a camera (or your own eye) actually sees is an interesting one. It's also a practical one, since astronomers use such sensors in their instruments, to view the behaviour of objects having large speeds (jets, active galactic nuclei, and so on). We'll return to this later, in Part II. It's important to keep the ideas of a grid and a single camera very clear in your head. They are very different things. You need to know which of these two ideas is being used in a given context. Many references use the word observer. That term is completely avoided here, because of its ambiguity. The word observer, in its typical usage, connotes a single thing - a single camera/sensor. But, in most cases, it's really referring to a grid. In an inertial grid, the speed and direction of motion of a freely moving object doesn't change. So, you can say that in an inertial grid, a freely moving object doesn't accelerate. You can test a grid to see if it's inertial by observing a freely moving object; if it accelerates at any time, then the grid isn't inertial. In principle, there are an infinite number of possible inertial grids. Each inertial grid is parochial ("confined to a narrow area"), in the sense that the raw measurements of event coordinates made in each grid are specific to that grid, and only that grid. The event coordinates don't match between grids. change the starting point (displacement): change the place selected for the origin (x y z)=(0 0 0), or the moment in time for which t=0. rotate: change the directions of the spatial xyz axes, to point to some other fixed directions. mirror reflection: swap the directions of the positive and negative directions for 1 or 3 axes. (The case of swapping 2 axes is actually the same as a rotation, so it's left out here.) You can do this for the time as well, by having the clocks go backwards into the future. boost: let the grid move in some fixed direction, at a constant speed (this is the only change that involves one grid moving with respect to another). So far, all we have is a big pile of data about events. Even worse, each member of the inertial grid family has their own version of the data, with different values for the where and when coordinates of each event. what can all members of the inertial grid family agree on? how do we move from the raw data of measurements, specific to each sensor grid, to the rules of physics? in summary, how do we go from the parochial to the universal? If a quantity is the same for all members of the inertial grid family, then it's said to be an invariant quantity. A better name for theory of relativity would be the theory of invariance, or something similar. The phrase theory of relativity is a mediocre term: it's ambiguous, leads to misunderstandings, and doesn't emphasize the most important idea. According to wikipedia, this dissactisfaction with the word relativity was even held by the theory's inventor, Albert Einstein. The term should really be abandoned, but it's difficult to change the inertia of long-standing tradition (if you'll pardon the pun). Rules must be expressible using only invariants. In a sense, relativity is the search for invariants - the search for what we can all agree on. This is a kind of mission statement, which starts a quest to find out what these invariants are, and what are their consequences. The most beautiful thing about this rule is that it's so deeply constraining. Constraints don't hurt a scientific theory, they actually help it, by making it easier to falsify. [An aside for experts] The rule-about-rules is often stated like this: The rules of physics have the same form in all inertial grids. But what exactly does it mean to say that a rule has the same form? What exactly is the same? The 'same-ness' of differential equations can be precisely expressed only with 4-vectors and covariance. But that language isn't appropriate for beginners. It's too complicated. It's also unnecessary. The fundamental covariant differential equations can be derived from a corresponding action integral. Action integrals are scalar invariants - quantities that are the same for all inertial grids. Hence, the principle of relativity can (and should) be stated in a simple form which speaks only of invariants - concrete numbers that can be derived from measurements - as opposed to more abstract ideas about the form of covariant differential equations. There's an invariant universal speed limit for all signals. What's a signal? Any physical object (matter, radiation) that moves from one place to another. So, the above rule says that no signal is instantaneous, and that the speed of any signal, anywhere in the Universe, at any time in the history of the Universe, can only be between 0 and a fixed maximum speed, as measured in any inertial grid. The speed limit is a universal constant: it's the same at all times, and in all places. Is this rule consistent with the rule-about-rules? Yes, because it speaks only about an invariant (the speed limit). In fact, the speed limit rule is simply an assertion that a certain invariant exists. The value of the speed limit is 299,792,458 meters per second, usually denoted by the letter c. Most people refer to this speed as the speed of light. But that's not the best way to think about it. For one thing, it's the speed of any massless particle, not just the speed of photons. The most important thing about this speed is that it's a speed limit for all signals. The existence of this speed limit means that the night sky is a time machine. When you look up at night and gaze at the stars, the starlight you see has different ages, from a minimum of 4.4 years (Alpha Centauri) to a maximum of 2.5 million years (the Andromeda Galaxy). The largest telescopes can detect light that is older than any dinosaur fossil, and even older than the Earth itself. The oldest light is the cosmic microwave background (detected by radio telescopes). 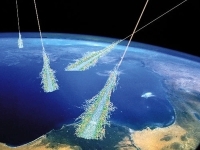 Its photons were emitted about 380,000 years after the Big Bang, which makes them about 13.8 billion years old. In this sense, astronomers are also archaeologists, looking backwards in time, using a fossil record made of light. The light has travelled undisturbed for even billions of years, until, at last, in a final act before ceasing to be, it offers up its quantum of energy, perfectly preserved for aeons, into the waiting bucket of a telescope, pointed by a curious human towards the night sky. Here's where the fun begins. You can combine the speed-limit rule with the rule-about-rules, and that's when weird things start to happen. If the speed limit rule is valid, then all inertial grids need to measure the same value for the speed limit. But remember that one of the allowable transformations for the inertial grid family talks about a boost, where one inertial grid is moving with respect to another. If two inertial grids are moving with respect to each other, then how can they possibly agree on the speed of anything? Most important, how could they measure the same value for the speed limit? So it appears that the these ideas are a complete flop, since they seem to contradict each other. But they actually don't contradict each other. The reasoning above is wrong because it assumes that speeds always behave as they do at low speeds. They don't. When speeds approach the speed limit, the behavior of measurements of space and time gets weird. This is the crux of the matter: if you insist that the speed-limit rule and the rule-about-rules are both valid, then you are forced into a serious re-examination of the basic facts regarding measurements of distance and time. The existence of a speed limit in Nature means we can use it as a natural unit for expressing any other speed as a simple fraction or percentage of the speed limit. In relativity, speeds are usually expressed in this way, using the conventional Greek letter β (beta), as in β = v/c. When the speed is a significant fraction of c, the motion is said to be relativistic. If β is nearly 1, then the motion is called ultra-relativistic. For most people, the speed limit seems incredibly fast. But in most astronomical contexts, the speed limit is actually very slow, because the distances are so vast. How much time does it take a photon to go from the Sun to the Earth? A little over 8 minutes. Even the Sun itself is so large that a photon needs 4.64s just to go a distance equal to its diameter. News may travel fast on Earth, but it sure doesn't in space. See this animation for a simple demonstration. What's moving in these cases is not a single object. Over time, the moving point is made up of different objects. For the laser lighthouse, the photons emitted by the laser all travel at the speed limit. What's moving on the Moon is a collection of different events, represented by different photons hitting the Moon at a different places, one after the other. Each photon obeys the speed limit, but the spot on the Moon can travel at any speed, with no limit. Thus, the time axis will have the same unit as the 3 space axes (meters, for example). If no object can travel faster than the speed limit c, then in diagrams using ct instead of t, the tangent of the history of any moving object can never be at an angle greater than 45° with respect to the vertical. We know how to draw the history for an object having β=0 (not moving at all) and β=1 (moving at the speed limit). But what about values of β between 0 and 1? How do you draw those? Well, that's pretty easy as well. You can find its angle with respect to the vertical using a simple geometrical construction, using your space-time diagram and a ruler. The example below is for β=0.3. As you can see, the trick is to take your ruler and divide the line BC into equal parts. It's important to understand that the tick marks on BC are evenly spaced, but the corresponding angles with respect to the vertical are not. The value of s2 for any two events is invariant. The space-interval Δd has always been parochial: when one grid is moving with respect to another, then the distance Δd between 2 events will, in general, vary between the 2 grids. That's not new. What is new is that the same applies to the time-interval Δt as well. That's new, because when physics began in the 1600s, the time-interval was assumed to be universal. But that was a fundamental mistake. Instead, it's the space-time interval s2, constructed from the space-interval Δd and the time-interval Δt, that's really universal, and neither of its parts. That is, time is parochial, not universal. "The discovery that time is relative brought about a profound revolution in our picture of nature. It represents one of the greatest victories of the human mind over the distorted notions acquired over the ages. It can be compared only with the revolution in human ideas brought about by the discovery of the fact that the Earth is a sphere." The formula for s2 defines the geometry of space-time. General relativity (also called geometrodynamics) is a theory of gravity. Like special relativity, it also centers on the idea of the interval as defining the geometry of space-time. The rules of geometrodynamics (rather complicated) describe how the presence of mass or energy changes the formula for the interval, and thus how mass or energy warps the normal geometry of space-time seen in special relativity. Inertial grid: In an inertial grid, the speed and direction of motion of an object that's not interacting with anything doesn't change. Invariant: If a quantity is measured to be the same in all inertial grids, then it's said to be an invariant quantity. Rule about all other rules: Physics rules must be expressible using only invariant quantities. Invariant #1: There's an invariant universal speed limit for all signals. Invariant #2: The space-time interval between any two events is invariant. Time is relative, not absolute. (The last rule can actually be seen as a consequence of the preceding two.) Everything else follows from these basic rules. All of the space-time diagrams and ideas presented below are essentially ways of helping you think correctly about the consequences of these rules. You begin investigating the structure of space-time simply by looking at the numeric sign of s2. Since all inertial grids agree on the value of s2, then they must necessarily agree on its sign too. Take any event A and then calculate s2 between A and the surrounding events. You can see that there is a surface where s2 is zero, and this surface separates the regions where the value of s2 is alternately positive or negative. The events having s2 = 0 with respect to A are said to have a light-like relation to A. In a two-dimensional space-time diagram, they form diagonal lines forming a big 'X' centered on A. If you add another space dimension, then these events will be in the shape of two cones with their pointy ends at A, with one opening upwards along the +ct axis, called the future light cone, and the other opening downwards along the -ct axis, called the past light cone. Both of these cones taken together are called the light cone of the event A. The history of any object travelling through event A at the speed limit will be somewhere on the light cone of A. The s2 > 0 events are centered on the time-axis. They are said to have a time-like relation with A. They are separated into two unconnected regions, according to whether or not the other event happens before or after event A. The region inside the past light cone is called the absolute past (or just the past) of A, and the region inside the future light cone is called the absolute future (or just the future) of A. The s2 < 0 events are centered on the spatial axes. They are said to have a space-like relation with A. In the two-dimensional space-time diagram, it looks as if there are two unconnected negative regions, but that's incorrect. When another space dimension is added (as in the middle diagram above), you can see that it's all connected together, on the outside of the light cone, and there's only one such negative region, not two. It's called the absolute elsewhere (or just the elsewhere). Note that events can't cross over from one region to another. That would violate the rules, since it would change the value of the s2. For example, if an event is in the past of event A according to one inertial grid, then it must be in the past of event A for all inertial grids. In space-time diagrams having ct as the time axis, the history of a signal travelling at the speed limit c is drawn as a line, 45° with respect to the vertical. Histories drawn at an angle greater than 45° to the vertical represent impossible signals, because they represent motions faster than the speed limit. event A can be affected by signals from events in its past, and only its past. event A can send a signal to events in its future, and only its future. none of the events in the elsewhere of event A can either send a signal to A, or receive one from it; that is, events in the elsewhere of event A cannot interact with event A in any way. If two events are related as cause and effect, then the cause must always precede the effect. In a space-time diagram, if event A is the cause of event B, then B must be able to receive a signal from A; in other words, B must be in the future of A. For any history, you can construct a light cone at any event along the history. Again, because of the limiting nature of the speed limit, the entire history will always remain inside the light cone. Geometrically, this equation defines a hyperbola in space-time near the event A. For different values of the constant, you get different hyperbolas. In a 2-dimensional space-time diagram, the hyperbola is a curve. If you add another space dimension, the hyperbola is a surface (called a hyperboloid of revolution). for positive (time-like) constant intervals, the hyperbolas 'open up' along the time axis. for negative (space-like) constant intervals, the hyperbolas 'open up' along the space axis. The most important point about hyperbolas is that they approach limits: they get closer and closer to straight lines, called asymptotes, but never actually touch them. Hyperbolas are said to be asymptotic. In our case, the light cone is an asymptote. In special relativity, this sort of asymptotic behavior is seen again and again. For example, a moving object can approach the speed limit, but it can never reach it (unless it has no mass, like a photon). If you had to describe space-time using a single word, that word would be hyperbolic. These surfaces appear repeatedly in special relativity. Instead of calling them "hyperbolas of constant interval", this site uses the more concise term interval shell (or simply shell for short). The strangest part of special relativity is the effect called time dilation. Time dilation is very small at low speeds, but becomes larger and larger as β approaches 1. The effect is this: take any pair of events having a time-like relation. Then, the time interval between these events can increase without limit, simply by choosing a different grid. The space-time diagram on the right is a bit unusual, since it combines information from two different grids. This just makes it easier to compare their measurements. Note that the event B appears twice in the last diagram, once for each grid. This is intentional, since it's the exact same event, as measured in the two different grids. Let's review what these diagrams are saying. The interval shell corresponding to this value is shown in the third diagram above. It must necessarily connect the two B's on the diagram, because of the basic rule that says that the square-interval between two events is invariant for all inertial grids. In the Home Base grid, the events are separated by both a time and a distance, since the Zoomer spacecraft is moving swiftly with respect to it. And, of course, the event B must be on the interval shell. Next, if you compare just the time interval between A and B, along the vertical ct axis only, as measured in the two grids, you can see there's a large disagreement. If you actually measure it on the screen, you'll see that the Home Base time interval is twice the Zoomer time interval. If the Zoomer time interval for skipping the rope is 0.5s, then the Home Base time interval is 1.0s. (The value of β=0.87 was chosen specifically to get this doubling. For other values of β, the factor is different.) You can also see from the shape of the interval shell that the disagreement in the time intervals is very small when β is small, and gets increasingly large as β increases. The faster the object, the slower the physics. To restate what we've seen earlier, measurements of time intervals are parochial, not universal. That is, it's only s2 between two events which is invariant. The time-interval between events can take different values, according to the grid used to make the measurements. Some people describe time dilation this way: moving clocks go slowly. This is true, and it's not a bad way of remembering it. But it's important to understand that time dilation applies to everything related to the moving object, not just its clocks: it applies to time itself. It's important to recall here something mentioned earlier: a grid is a grid of sensors having synchronized clocks, each of which records only the nearby events. That is, there are many sensors in a grid, not just one. So, for our astronaut skipping rope on the Zoomer spacecraft, the times recorded for the two events A and B in the Home Base grid are recorded by two different sensors. In fact, the various measurements shown above involve 3 different sensors - one in the Zoomer grid, and two in the Home Base grid. What happens when you reverse the perspective, and take the Home Base spacecraft as moving at β=0.87 with respect to the Zoomer spacecraft instead? You see the same effect - the physics on the moving object goes slow. On the surface, this seems to be a contradiction: how can the physics be slowed down on both spacecraft at the same time? first, the phrase "they are both going slow at the same time" assumes what is not true - that the passage of time is universal. second, each case uses 3 sensor clocks, as mentioned above. This makes a total of 6 sensor clocks to make all the measurements, and they are all different sensors; none of them are the same. There's no contradiction since the measurements are all made by different clocks. The factor by which the time interval is increased is officially called the Lorentz factor, but here we'll simply call it the warp factor. It relates to the distortion of times and distances when high speeds are involved. The traditional symbol for the warp factor is the Greek letter gamma Γ. (The small gamma 'γ' renders poorly in many browsers, so this site will use a capital gamma 'Γ' instead.) Like β, you will see the warp factor Γ appearing repeatedly. The warp factor Γ depends only on β. It increases slowly from 1, and then increases very rapidly as β approaches 1. It has no upper limit, and increases without bound. This is true in the Zoomer grid. But for any grid which is moving with respect to the Zoomer grid, it's no longer true. In general: for any events A and B that have a time-like separation, you can always find a grid in which the the spatial distance between A and B is 0. This just corresponds to the 'lowest point' of the interval shell. In such a grid, the interval is measured just by a single sensor clock in that grid, located at the same position as A and B. A time interval measured by such a sensor clock is called proper time, but it's important to remember that the proper time is just the same old space-time interval, measured in a certain way. the hard way: make the usual where and when measurements as it passes through your grid. Then, for any pair of events, calculate the interval using the interval formula (see above). the lazy way: just attach a sensor to the moving object. As it passes through your grid, your grid sensors will talk to the moving sensor, and ask it for its time reading. Then, the interval between two events in the object's history is just the difference between two such time readings, multiplied by c.
You can remember this like so: An object's wristwatch-time is proportional to the interval between events in the object's history. Let's return to the example of the two spacecraft, Zoomer and Home Base. Let's focus on the history of a single sensor, a sensor belonging to the Zoomer's grid, but let's record that history in both the Zoomer grid and the Home Base grid. This is almost the same space-time diagram as before, but now we have a full history of the sensor, not just two separate events. In the Zoomer grid, the sensor doesn't move, β=0. In the Home Base grid, the Zoomer-sensor is moving at β=0.87. The dots show three ticks of the Zoomer-sensor's clock. You can easily see the effect of time dilation. As the Zoomer-sensor passes through the Home Base grid, it shares its current time reading with the various Home Base sensors it meets along the way. (Remember that sensors can only record local events.) Note that the Home Base sensors record an event like this, for example: at a Home Base time of 6.0s, the passing Zoomer-sensor says that its own time was 3.0s. It's important to have this exact picture in your head when thinking about time dilation. The clock moves through a sensor grid, and as it moves through the grid, the moving clock's time is compared with the time on the many grid sensors it meets along the way. To see the effect of time dilation, you need at least 3 clocks: the moving clock, and at least 2 grid sensors to compare it to. This example uses a sensor clock, but the same effect is seen with any object. If a banana takes 7 days to turn brown on the Zoomer spacecraft, then, according to the the sensor readings in the Home Base grid, it will take 14 days (if β=0.87). That is, moving bananas take longer to turn brown. So, for the Zoomer-astronaut, the travel-time to any destination can approach zero time. Here's an example, using a proton in the Large Hadron Collider. Pretend that one of these protons is sent on a proton vacation to the Pleiades, a cluster of stars about 385 light-years from Earth. If you were able to attach a wristwatch to this proton, what would it record as the travel-time of the proton to the Pleiades? This is a stunning fact. There is a universal speed limit c, but from the point of view of an actual traveller, this does not limit the travel-time seen by a traveller in any way. In principle, a traveller's travel-time from any place in the Universe to any other place in the Universe can be made as small as desired, by getting closer to the speed limit. Zounds! As β approaches 1 and Γ climbs higher and higher, the geometry of space-time lets you travel quickly to the stars. This is just the effect of time dilation, of course. Moving clocks go slowly. Here's a strange fact to chew on: each child's watch reflects how much exercise the child had. The more running done by the child (either for longer times, or at greater speeds), the greater the warp factor Γ, and the greater the time difference between the parent's watch and the child's watch. You can also look an it this way: when you take a trip, the distance travelled is shown by your odometer. Everyone knows that its reading depends on the route you took. If you took a longer route, the odometer shows a larger number. But a similar sort of thing can also be said of the elapsed time on your wristwatch. If two people leave from event A, separate, and then arrive later simultaneously at event B, then the elapsed time on their watches won't agree, and will depend on the details of how they made the trip. Again, time is parochial. The above scenario with the playing children provides a rule to distinguish between accelerated and unaccelerated motion. In an inertial grid, a freely moving object moves without any acceleration. It doesn't change speed, and it doesn't change the direction in which it's moving. In a space-time diagram, the history of a freely moving object is the simplest kind of history - a straight line, at some angle with respect to the vertical ct axis. For any such object, we know that we can pick a grid where the object is actually at rest; in that grid, the history is a vertical line. Everyone's history joins event A to event B. Everyone starts out at one place-and-time (event A), and then, later, they join up again at the same place (event B). The history for the stationary parent is vertical, while the histories for the running children wiggle around the vertical, because they run around while playing outside. In other words, the children's histories show accelerated motion, while the parent's history does not. The histories of the parent and the children form a set of histories that share a start-event A and an end-event B. Other than that, they can wiggle around a bit in between. Let's call this a set of wiggle histories. It's useful to include the parent's history as being just another wiggle history, where the wiggle happens to be zero. graphically, uniform motion is just a straight-line history connecting A and B.
numerically, uniform motion has the maximum reading on a wristwatch attached to the object, compared to the same reading for any alternative wiggle history between A and B. This is sometimes called the maximum ageing rule. As we saw before, the reading on the wristwatch, multiplied by c, is just the space-time interval. So, you can also say that uniform motion has the maximum total interval in comparison with the nearby wiggle histories. calculate a number for a small part of the wiggle history; this number is called the lagrangian. sum up the lagrangian values along the wiggle history; this sum is called the action. single out one wiggle history from all the others, as having a minimum (or maximum) value of the action. In the case of the maximum ageing rule in the previous section, the numbers being added up are the wristwatch time intervals, along the wiggle histories. The rule is that the total wristwatch time is maximum for the history that has no wiggle at all. Notice that the product mcds is an invariant. This means that the sum S of many such items, represented by the long ∫ symbol, is also an invariant. In the inertial grid family, there are 4 kinds of allowable transformations. Only one of these transformations involves a speed: the boost transformation, where one grid is moving with respect to another, at a fixed speed, and in a fixed direction. The only difference is that grid 2 (in red) moves along the x-axis, in either the positive or negative direction, with respect to grid 1 (in black). Here, β is a velocity - it has both a size (the speed) and a direction (along the + or - x-axis, as indicated by the sign of β). Given the event coordinates in grid 1, the task is to find the coordinates for the same event in grid 2, which is moving in this specific way with respect to grid 1.
put your left hand in front of you, with the palm facing you. point your fingers to the right. This indicates the direction of motion of grid 2 (with β>0). imagine squeezing a tube of toothpaste with your hand in that position; this will indicate the direction of the flow of events. For β<0, you do the same thing, but with your right hand instead of your left. That's the general picture of how event coordinates change from grid to grid, during a boost. transform multiple events that define a history. This is an important animation, and you should experiment with it. These space-time diagrams are a bit unusual, since they have two sets of axes. The blue set of axes (for grid 2) is at an angle with respect to the black set of axes (for grid 1). Don't attach too much importance to the distorted appearance of grid 2. The distortion isn't "real", it's just how grid 2 looks with respect to grid 1. From grid 2's point of view, grid 1 looks distorted, in a similar but reciprocal way (with β having the opposite sign). Find the directions of the axes, using β. This is done using the same technique as before, with β marked off on a horizontal scale, from the ct axis to the light cone. The sign of β controls which way the angle goes - to the left or the right of the ct axis. The angle between the ct and ct' axes is the same as the angle between the x and x' axes. From the event whose coordinates you want to find in grid 2, draw lines parallel to the new axes, and read off the corresponding numbers on the ct' axis and the x' axis. Remember that -1<β<1. That is, β is the velocity along the x axis, not just the speed. It can be either positive (grid 2 moving in the +x direction) or negative (grid 2 moving in the -x direction). These equations describe how an event changes coordinates during a boost from one inertial grid to another. Let's call these equations the boost transformation (also called the Lorentz transformation). This shell shows the set of possible coordinates for event B, as seen from different grids that are moving with respect to each other. Notice that event B can come before A (appears lower than A in the diagram), or it can come after A (appears higher than A in the diagram). It can also come at the same time as A (simultaneous). In other words, the time order of events having a space-like interval is not invariant. It can change between different grids. Also, if two events with a space-like interval are simultaneous in one grid, then they will not be simultaneous in a boosted grid. A grid measures the coordinates of events, and it can easily measure the distance between two events. But how does it measure the distance between two objects, when they may be moving around? To measure the distance between two objects, you first need their histories. Then you pick a time, and draw a corresponding horizontal line ct=constant in space-time. The horizontal line will connect the two histories, and the distance between the two objects at that time is then just the Δx along that horizontal line. Let's return to the Zoomer and Home Base spacecraft, and look at the spatial dimensions (the size) of the Zoomer spacecraft. For y and z, the dimensions are the same. For the dimension in the direction of motion, the size is divided by Γ (with Γ calculated using the speed of Zoomer), and is smaller, since Γ is greater than or equal to 1. The same can be said of the volume of the Zoomer spacecraft as well: the volume is also divided by the same number Γ. This effect is true for the distance between any two objects, not just the front and rear of a spacecraft. Let's call this effect directional distance compression, or distance compression for short. Both time dilation and distance compression have the same underlying cause: the geometry of space-time. You can think of both of these effects as being two aspects of the same thing. Both time intervals Δt and space intervals (distances) Δx are parochial. They change values from one grid to another. The values of Δt and Δx in any one grid have no special status. For example, the assertion that the Pleiades has a specific distance of 385 light years is a parochial statement attached to a specific grid, a grid comoving with the Earth. In other grids, moving with high Γ with respect to the Earth, and in the direction of the Pleiades, it's a different story: the effect of directional distance compression compresses the distance to the Pleiades, and divides it by the value of Γ. As seen above, the boost transformation makes events flow like toothpaste in space-time. Some pairs of events are stretched out, while others are squeezed together. Time dilation corresponds to the stretching (expansion by a factor of Γ), and distance compression corresponds to the squeezing (reduction by a factor of Γ). When you consider volumes of space-time, then these two effects actually cancel each other out. The volume of a region of space-time is invariant. It's interesting to note that the "flow" of space-time volumes resembles the flow of an incompressible fluid. If a civilization can engineer spacecraft that can travel at very high speeds, where Γ takes a large value, then the effects of time dilation and distance compression will significantly affect the experience of travellers. As a threshold for high-Γ travel, you might take the value Γ=2, corresponding to β=0.87. To the traveller, high-Γ travel is experienced as a combination of wormhole and time machine. After the travellers have reached the other star, then, in a grid attached to the Earth, the travellers are also in the deep future. From the Earth's perspective, it's taken a long time for the travellers to reach their destination. From the traveller's perspective, they will know intellectually that they are now in Earth's deep future, but they won't feel it in their bones: when they turn their radio telescopes back towards the Earth, they will pick up transmissions that were emitted long ago. To the traveller, nothing very strange will be seen in the apparent date of these transmissions. Of course, if they make the return trip back to the Earth, that impression will be corrected, and they will finally experience the time-machine aspects of high-speed travel. In ordinary geometry, each point in space is a certain non-zero distance from all other points. In the hyperbolic geometry of space-time, however, the same cannot be said of events. In space-time, each event A has its light cone, the set of events having light-like (zero) intervals with respect to A. The event A is, roughly speaking, "nearby" these other events, and those other events are stretched out across the Universe. Of course, to take advantange of the "closeness" of the events on the future light cone, travellers need to have a high value of Γ. If you take seriously the idea that no one member of the inertial grid family has special status, then the fact that high speeds are needed is seen as a detail. Is Time The Fourth Dimension? Yes and no. As we saw in the beginning, the basic idea of space-time is a pretty simple one. You just translate times into distances, in order to draw a picture of an object's history. In this rather trivial sense, yes, time is treated as a fourth dimension. But there's nothing deep or strange about that. the geometry of space-time is defined by the formula for s2. In that formula, time and space are not treated the same - there's a difference in sign. The time is not treated as just another space coordinate. Because of this, many people refer to space-time as having a 3+1 structure, to emphasize the difference. To create new rules that are compatible with special relativity, you need to express them using invariants. it transforms one set of 4 numbers (ct,x,y,z) to another set of 4 numbers (ct',x',y',z'). it uses only β and Γ, which are both dimensionless - they have no unit, and are pure numbers. mathematically, it guarantees the invariance of this quantity, built out of the 4 parts: c2t2 - (x2 + y2 + z2). This is just the squared interval with respect to the origin event (0,0,0,0). If you find a new 4-pack of numbers that behaves according to the rules of this little machine, then you will also have found a corresponding new invariant. These 4-packs are called 4-vectors. The game played by physicists is to make guesses about new rules, with new 4-vectors, and their corresponding invariants. They then see if those guesses are in agreement with experiment. It's stunning that the geometry of space-time so tightly constrains the creation of new rules. Does this correspond to anything in Nature? Yes. This precisely describes motion of a particle in an electromagnetic field! In fact, all of the equations of electrodynamics (electricity and magnetism) are expressed most elegantly using the language of space-time and 4-vectors. Pure mathematics starts with general principles or axioms, and then deduces consequences. In math, the only constraints are those of logic. Physics is almost always presented to the student in imitation of mathematics, with many separate results deduced from a few general principles (as is done here on this website). It's interesting and important that physics imitates mathematics in this way. But, in the end, you must remember that in physics the final arbiter is not logic - it's experiment. Strictly speaking, there's no idea of "proof" in physics; at least, not in the formal sense of the word used by mathematicians. Velocity is a vector, and has both direction and speed. During a boost transformation, the xyz components of the velocity vector change from one grid to another. Of course, this transformation follows the rule that the speed of any object cannot exceed the speed limit. This always remains true, no matter how big the boost, and no matter how big the original speed in the unboosted grid. the boosted speed never exceeds the speed limit (the large outer circle). when the object's speed is 1 in the unboosted grid, its speed remains 1 in the boosted grid. when the object's speed is 1, only the direction of the velocity vector changes. In this case, the transformation of velocity leads to the aberration of light. This concludes Part I, which covers the fundamental ideas of special relativity. Please continue on to Part II, which explores light signals and optics.